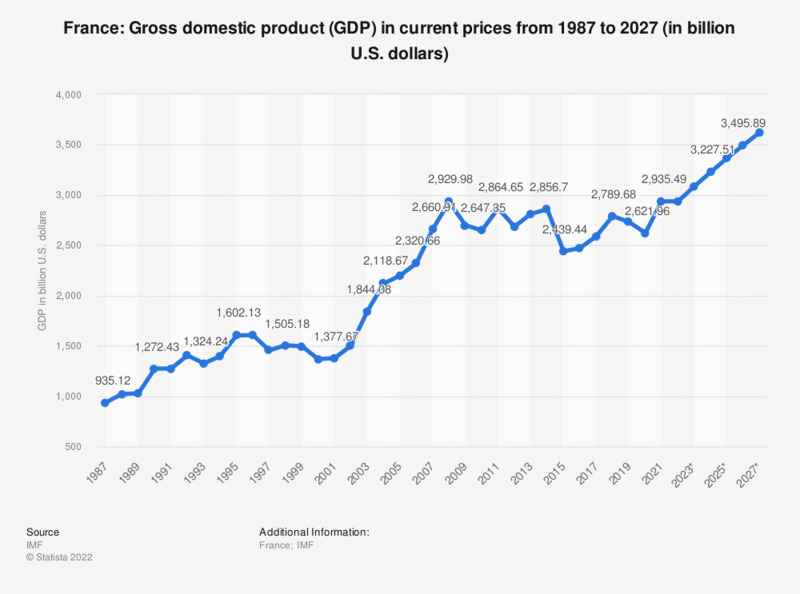 This statistic shows the gross domestic product (GDP) in France from 2012 to 2017, with a projection up until 2022. GDP refers to the total market value of all goods and services that are produced within a country per year. It is an important indicator of the economic strength of a country. In 2017, the GDP in France was around 2.59 trillion U.S. dollars. France is an economically developed nation and one of the members of the G7. France is also considered to be one of the leading countries in Europe, often seen as the second most important nation in the European Union behind Germany. France has a relatively high gross domestic product (GDP), being one of the top 10 countries with the largest GDP in the world in 2014. Despite this, the country is still ranked in the top 20 in regards to its public debt compared to its GDP in the same year. A high debt-to-GDP ratio demonstrates a country’s ability to produce and sell goods and services in order to be able to pay back its debts, however producing and selling these goods should not result in more debts. France’s national debt slightly increased year-over-year up until 2014, most notably between 2008 and 2009. Additionally, France reported a large trade deficit in 2012, a value almost 5 times larger compared to the previous year, indicating that the country is importing much more than it is exporting. This often leads to higher debts due to a need to borrow more money to produce goods. Everything On "France" in One Document: Edited and Divided into Handy Chapters. Including Detailed References. Statistics on "Economic Outlook France"
Does the outcome of the election in France have impacts on your voting intention in Italy? How often do you read digital news using a tablet or smartphone?